Domestic breeds of chickens are derived from wild chickens that still crow in the jungles of Southeast Asia. The Red Jungle fowl is thought to be the primary ancestor of domestic breeds, but the Gray Jungle fowl has also contributed some genes. Wild chickens are still numerous in many parts of southern Asia, and chickens have escaped captivity and gone feral or “wild” in many subtropical regions in other parts of the world. The many dog breeds are an example of what man can do by selectively breeding for certain traits. Dog breeds from Chihuahuas to Saint Bernards derived from the wolf. During domestication, not only did the size change, but the color, hair type, and body shape were altered in numerous ways as well. Chickens may not have as many body variations as dogs, but they do have a few, and man has managed to change the color and “hairstyles” of some chickens as well. Wild hens weigh about 3 pounds, and wild roosters weigh 4 to 4-1/2 pounds. More than 200 breeds of chickens exist today, ranging in size from 1-pound bantams to 15-pound giants. Wild chickens are slender birds with an upright carriage. Some of that slender body shape remains, but modern chicken breeds have many body variations. When you bite into a juicy, plump chicken breast from one of the modern meat breeds, you’re experiencing one of those body variations firsthand. Domestic chickens come in a wide range of colors and patterns of colors. Modern chickens generally keep the distinct color differences between male and female, with the males remaining flashy and the females more soberly garbed. However, in some breeds, such as the White Leghorns and many other white and solid-color breeds, both sexes may be the same color. Even when the chickens are a solid color, differences in the comb and shape of feathers help distinguish roosters from hens. 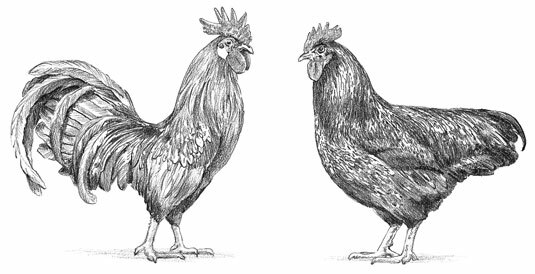 However, in the Sebright and Campine breeds of chickens, the hens look like the roosters, with only a slight difference in the shape of the tail. The following figure demonstrates the differences between roosters and hens. It’s really quite amazing how man has been able to manipulate the genetics of wild breeds of chickens and come up with the sizes, colors, and shapes of chickens that exist today.